T2Tennis started in 2002 as a neighborhood league in the north metro area. Today, more than 60,000 tennis enthusiasts play in T2Tennis leagues across 1,500 tennis facilities throughout Atlanta. The flexible format is designed to meet the needs of today's player's busy lifestyle. T2Tennis combines structured organized league play and flexible scheduling to provide a convenient, fun tennis experience. Whether a beginner or an advanced player, you’ll enjoy friendly competition, great exercise, and the chance to improve your game! T2Tennis has a league for everyone and with thousands playing you will meet new players every season. 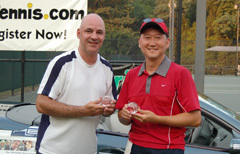 T2Tennis is a fun, friendly tennis league without the hassles. No all-day events. No line-ups, waiting for matches to finish or position concerns! Just show up, play a great match, have fun and be finished within a couple of hours. T2Tennis is the perfect complement to your large team leagues. You can play more tennis and be a step ahead of the competition when those team leagues start! See the Calendar for specific league dates and registration information. With 11 playing levels and extensive match play history, players are matched against opponents with similar skills and abilities. When you play T2Tennis you can be assured of enjoying fair and competitive matches. For Adult leagues, T2Tennis uses the NTRP rating guidelines for determining players playing level. T2 also offers minus (-) levels creating a total of 11 playing levels from 2.5- to 5.0/Open. Flexible means you. . .